Recently I read an article on the Cato at Liberty blog. It was titled "Paris Whopper of the Day: The Sahara Is Expanding." The author, Patrick J Michaels, points out a huge lie that was told by some African leaders to the President of France at the conference in Paris. It's not shocking that they lied. The idea that climate change alarmists will start to quote the lie until it becomes true in the minds of a gullible public is what's shocking. You can read the short article at the link if you choose. But the real point for me was an idea for a feature on this blog called The Whopper of the Day. Maybe we should do a reader participation feature once in a while based on submissions from you folks when you see whoppers being told without the teller even blinking an eye. John Kass of the Chicago Tribune writes regularly about the MOUTZA of the month. It's based on the suggestions of readers who nominate deserving people or ideas they find in the news. I'll let you read up on what a Moutza is if you feel inclined. But suffice it to say, it's not an honor. It might be fun to expose some Whopper lies or even to discuss whether something actually is a lie. 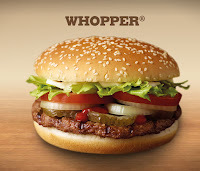 So decide if you want to submit them when you see them and I'll act as the final arbiter of the biggest whoppers. We might even give an award to the best submission. Perhaps a hearty handclasp or a mention of your name so the huge audience of this blog can admire you. Maybe we will use this image to honor those who submit the best examples of Whoppers. I'd be lying if I told you this will become the next big thing on the net and go viral. In fact, that would be a Whopper.